Disclosure: Some of the links below are affiliate links, meaning at no additional cost to you, we will earn a commission if you click through and make a purchase. We only link these products we have used or use and have been satisfied with. We show you how to make your own furniture with having only basic tools and skills. You don't any fancy tools to make this wall shelf. The only tools you need are a saw, a drill and the painting equipment. 1 Cut or have cut to length the laminated pine shelves. The measures will be 3 of 800 x 200 and 3 of 1200 x 300 mm. 2 Use a jigsaw to cut out the slots as shown in the diagrams above, and also a 40 mm long rebate for mounting the keyhole hangers at the back of  uprights. GOOD TO KNOW: For perfect straight lines use a steel ruler to draw out the cut lines. 3 Assemble the screws for the corroborating the shelf to the wall using a drill. 4. Before assembly, take the time to sand all the boards and cut edges nice and smooth. 4. 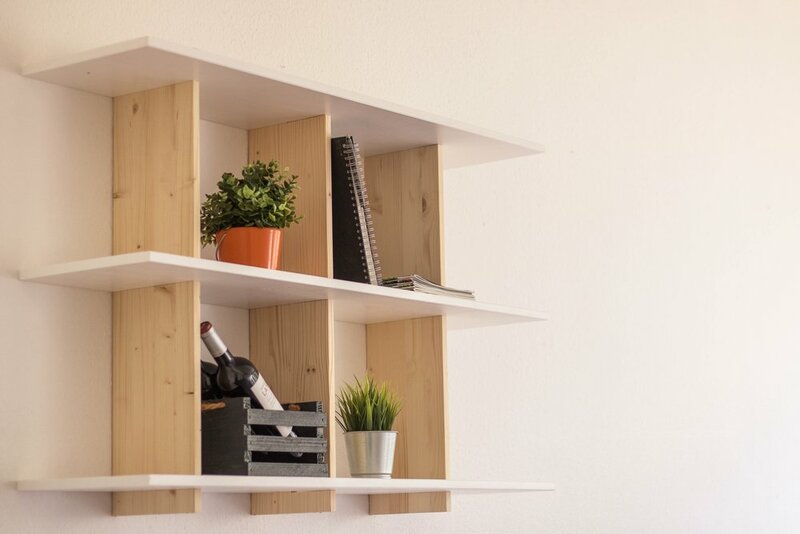 If you are painting the horizontal boards as we did for our shelf, do this now. GOOD TO KNOW: If painting the shelves, apply as many coats of paint as you need but be sure to allow drying time between each coat. 5. Slot the uprights into the shelves. If necessary, tap gently with a rubber mallet to lock the pieces together.